Dev and Mo yet again get hit hard with the life stick. Catch up with them as the go through the rundown and ch ch ch changes. Coach and Dev are joined this week by the infamous Chaufie. Come kick it as they talk all things entertainment and weather or not a Space Jam remake is a good thing. Join The Coach and Dev as they take a brief second and get serious about a few things and then descend into madness created by the lack of flavor found in La Croix. 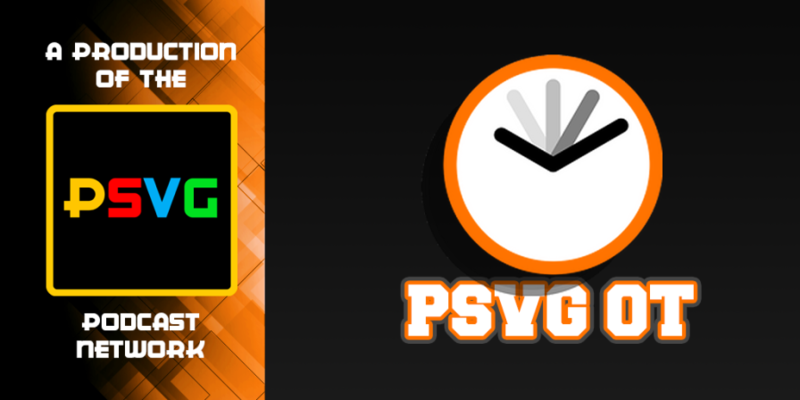 PSVG OT 46: Story Time! Story time is upon us! Sit back and relax as The Coach and Dev regale you with tales as old as time and give you a peak into a few of their favorite podcasts and why they listen to them. Ring in the New Year with Mo, Dev and special guest Justin (fresh off PSVG DLC) as they talk about a few firsts, and how to go about making and keeping your New Year resolutions. Join Coach Mo and Dev on Christmas Eve (and Eve Eve ) as they discus the merit of sports game consideration for GOTY as well as some of their Christmas favorites. Come ride with The Coach and Dev as the welcome the return of the Loborrrrrican, (looks like we didn't scare him off for good) as we chat about our first day of college and where me see ourselves as E-Sports Gods. PSVG OT 42: THE OT IS BACK!! Time to catch up with The Coach and Dev and see where life has taken them during the absence, also What's the deal with Mario Tennis? PSVG OT 40: The Number That Kev had to look up and get mad about.